Energy: fracking straws in the wind? Despite the hype over the discovery of shale gas, there have been more than a few signs that things are not necessarily as bright as they are painted. And now we get an interesting piece in Sueddeutsche Zeitung which tells us that the euphoria of the past two years could soon turn into disillusionment. 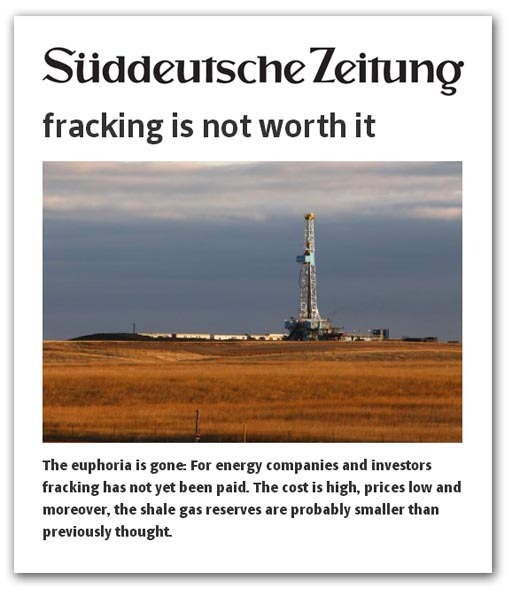 New figures show that among the investors enthusiasm for fracking has already slowed down considerably. In 2013, international companies spent $3.4 billion for stakes in US shale-rock formations, less than half of what they invested in 2012 and a tenth of their spending in 2011, according to data from IHS Herold, a research and consulting firm. It is a sign of leaner times for the cash-hungry companies that have revived American energy output. The value of deals involving US energy producers plunged 48 percent this year from 2012, to $47 billion, the first annual decline since 2008, IHS says. It turns out, though, that this is a straight re-hash of a story of a story that appeared recently in the Wall Street Journal, although it doesn't appear to have found its way into the British media. Continuing with that source, we learn that US oil and gas producers have started to slash spending. "The days of easy money are over," said Amy Myers Jaffe, executive director of energy and sustainability at the University of California-Davis. "The emphasis is going to be on lowering costs". Foreign cash has been helping to cover the cost of the deep wells and the heavy horsepower required to unlock oil and gas from shale and other dense rock in the US. And the need for it has been acute. Last year, 80 big energy companies in North America spent a combined $50.6 billion more than they brought in from their operations. That deficit was twice as high as in 2011, and four times as high as in 2010.The same producers have dialed back through the first nine months of 2013, though they still spent about $18.7 billion more than their cash flow. Analysts at Sanford C Bernstein say that US and Canadian producers are "returning to spending within their means", turning to other investors, including private equity and the stock market, as overseas buyers lose their appetite for American energy projects. The shift has big implications for the oil and gas industry, analysts say, because Wall Street investors tend to be more sensitive to profits and stock prices, while foreign investors have historically been more focused on acquiring energy reserves and technology. John Walker, chief executive of EnerVest, a company with strong shale interests, says, "The whole market changed". Asian investors were interested in the company's Utica Shale assets, he said, but very few bid. EnerVest has shifted gears, marketing the Utica properties in smaller packages to appeal to other energy companies with less cash on hand. More detail points to the tightening of investment, but the interesting point from the UK perspective is that the money isn't exactly flowing here either. One possible good bit of news is that the threat of a new EU law to control fracking may have been delayed. The current Commission, in the dog days of its tenure, seems to have put proposals on the back burner. But this might be only a temporary respite, if the Financial Times has got it right. The "colleagues" seem to have ambitions of a new energy policy that has been eluding them since the Yom Kippur War in 1973. Serious moves are afoot, which may end up with unpleasant additions to a new treaty. For the time being, though, the promise of endless energy isn't quite materialising. The hype may be all we actually get and, by the time the "colleagues" get stuck in, even that may be a distant memory.